Friday was another long day. I am just starting to write this post at 1:52 am on Saturday morning. I’ll be back at Miller Park in nine hours. I’ll start from the beginning of Friday though. I had two doctor’s appointments scheduled for Friday, one at 9:20 and the other at 10:30. The first was with the orthopedic doctor regarding my knee. We looked at the MRI together and he pointed out the parts of my left leg bones that have dead tissue (bone infarction). They show up as a different shade of gray on the screen, and are “outlined” in black. He said the problem could fix itself, and that they have likely been there for quite a while. He doesn’t think that it’s related to the knee pain, and he prescribed some physical therapy. We’ll see if I can work that into my schedule, but hearing that I can’t really further the damage is a relief. It’s still strange to think that parts of my bones are dead, but can slowly come back to life, if you will. The other appointment was for my elbow, and the doctor also prescribed physical therapy. There is a Dean clinic in Fort that I may be able to get both done at, so I’ll have to try and work that in. It’ll have to wait until the 21st at the earliest, because I’ll be in New York and Houston this coming week. I got back to Fort around noon, and began packing stuff up for the game. Victoria had planned a tailgate-date, and were looking forward to the two person tailgate. 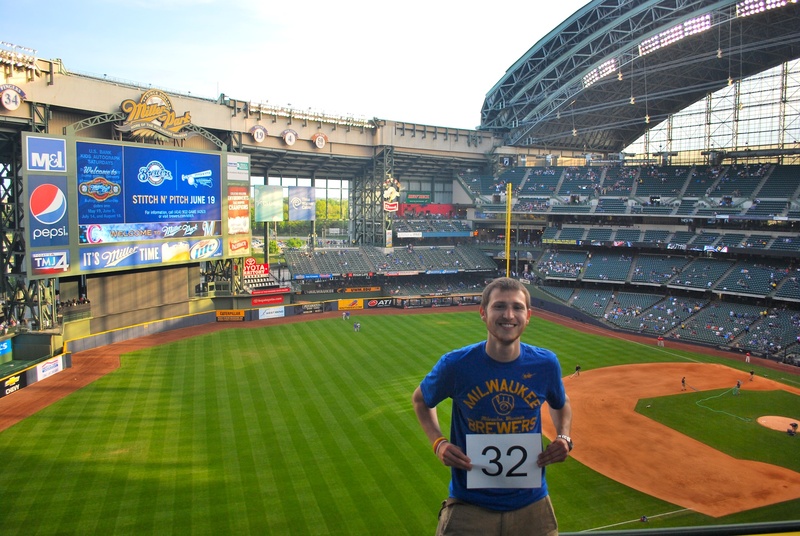 We met in Johnson Creek, and we arrived at Miller Park just before 4 pm. We had to wait a few minutes for the lots to open, but once they did we got a spot right up towards the front. 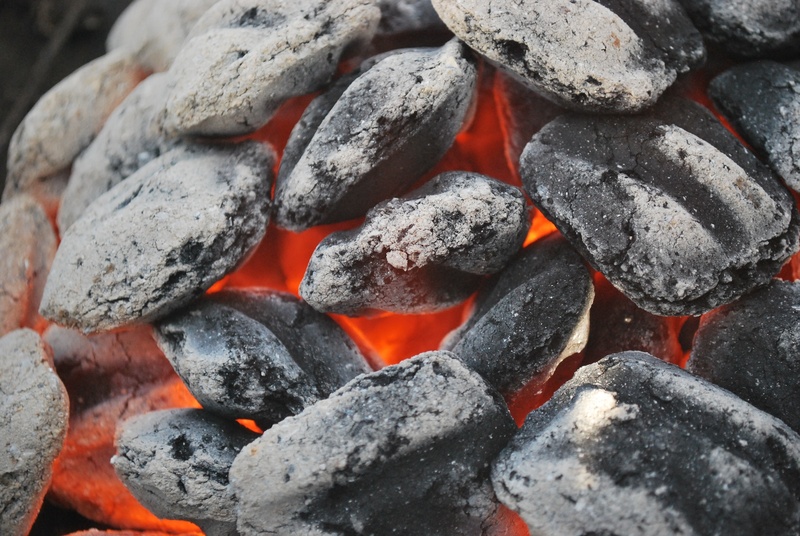 After a few minutes of heating up, the charcoal was ready. We had Johnsonville Polish sausages and some Oscar Mayer turkey dogs. I wound up eating two polish and one turkey dog, as well as some cole slaw, fruit salad, some wheat thins, and a few beers. I was quite full when we went in for the game. If we could’ve gotten the front row parking spot this picture would have been much better, as is it contains a stranger just glaring at my camera. The bokeh makes her un-identifiable, but it still diminishes a pretty good photo opportunity. 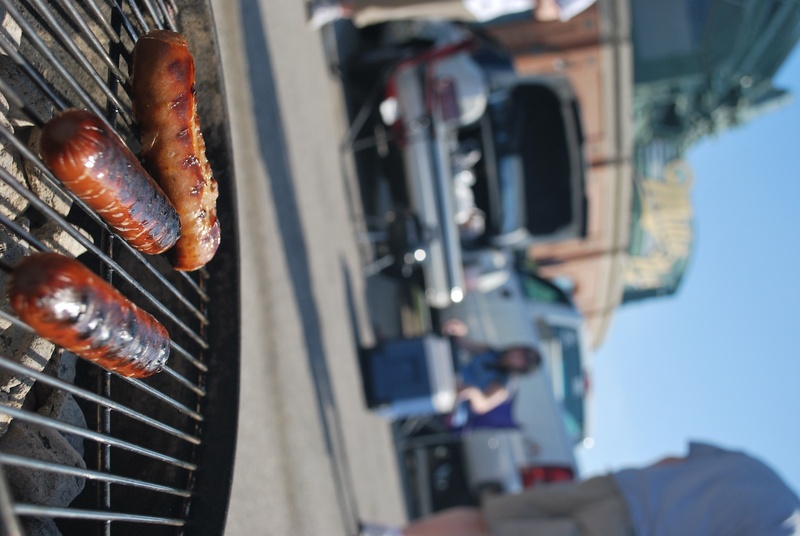 Incased meats and Miller Park, it’s hard to beat that combination. We tailgated until 6:10 and then headed inside so we could get game photo number 32 without having too many people in the way. It worked out well as the row I was in had people on both aisles, but none where I was standing; nice! I forgot to mention in Wednesday’s post, but Kathy Schwab, the Brewers Senior Director of Marketing, who is my main point of contact, stopped by and gave me two new shirts. Thanks Kathy! I wore one for Friday’s game, thus the mention. After getting the game number picture out of the way, we met up with Alex and Jess. I stayed with them at their apartment in Chicago from April 9th to April 13th, when the Brewers had a four game series with the Cubs. Alex was born and raised in a Chicago suburb, so he’s a Cubs fan. Jess was born and raised in Wisconsin, so she is a Brewers fan. They both aren’t too serious of fans, so it works for them, I don’t know I could do the same. Jess and her family were at the game, and she has told me recently that her dad is a huge fan of the blog, and actually has it as his homepage. So I have to give a shout out to Dave, a Wisconsinite through and through, thanks for the support and the loyalty. We had a picture taken while we were in the upper deck of the six of us. The back row is myself, Victoria, Alex, Jess, and Matt (Jess’ brother). 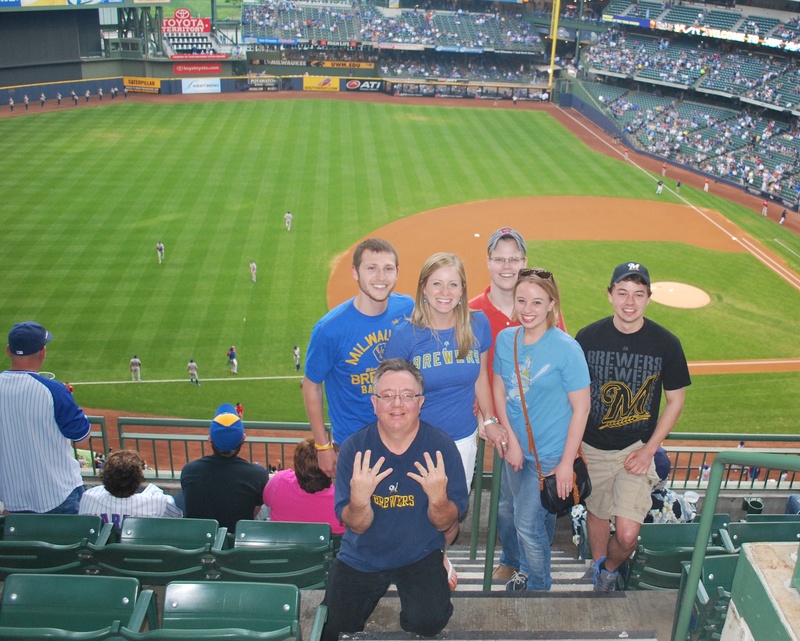 In front is Jess’ dad, Dave, he’s holding up eight fingers for Ryan Braun’s number (at least that’s what he told us). I hope this also doesn’t double as a gang sign, because then Dave, and myself (by association), might be in trouble. We got down to our seats in section 221 just in time. I ran to the bathroom quick before the game started as Victoria went to the seats. When I came back down the staircase I saw Victoria sitting in seat 13, as usual, and sat next to her. In the first inning someone came down and said: “we have the five on the aisle”. I came back with “wrong row, this is row six”. The guy said it wasn’t, and I even pointed to the side of the chair and said “it says row six right here” (without actually looking at it myself). It was then that we realized Victoria had sat down in row eight, and we actually were in their seats. I felt like a complete moron for trying to tell the guy off. I blame myself for not double checking when I came down the aisle, but a little blame has to go to Victoria for sitting in the wrong seats in the first place. I’ll cut her some slack though because I’m usually leading the way to our seats. The game was a marathon. Sixteen pitchers between the two teams were used, and four hundred sixty six pitches were thrown, yes I said 466! The game started at 7:10 and lasted until 12:14 am. The Brewers got on the board early with a run in the first, but they should have gotten more. Aramis Ramirez grounded into a double play with the bases loaded, and the run that scored on the play was the lone run until the seventh inning. The Brewers’ Jose Veras loaded the bases with only one out, and Kameron Loe was brought in to try and induce an inning ending double play. Instead, on the first pitch he threw, David DeJesus took him deep for a grand slam, and the Cubs had a 4-1 lead, just like that. The Brewers got two quick outs in the bottom of the seventh but Bruan walked and Aramis Ramirez doubled him home. An infield single and a walk followed, which gave the pinch-hitting Lucroy a chance with the bases loaded. Almost everyone was on their feet, including Mr. 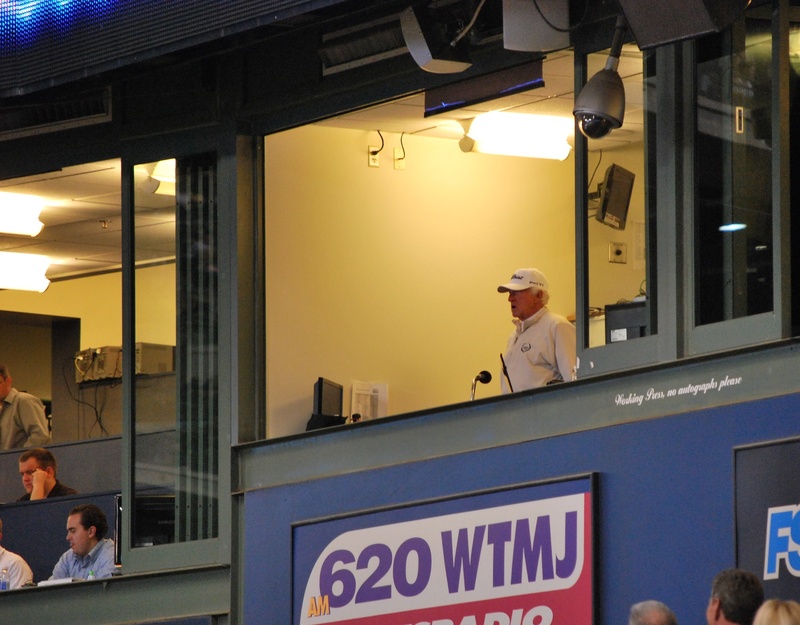 Baseball himself, Bob Uecker. Lucroy hit a scorching double to the right field corner, and the Brewers took a 5-4 lead heading into the eighth inning. K-Rod got the job done in the eighth, but Axford blew the save, and ended his streak of 49 consecutive “saves”. I put it in quotes because like I said before, I’m not a big fan of the created statistic. The Brewers still had a chance in the ninth, even though a lot of Brewers fans didn’t think so, and many headed for the exits after the Cubs took the 7-5 lead. Braun flied out, Ramirez walked, which brought Chart (yes, I mean Chart: C+Hart=Chart) to the plate as the tying run. That is all you can really hope for in those situations; bring up the tying run and hope for the best. Chart had a great at bat, and on the 10th pitch he sent one deep to left that tied it up at seven. 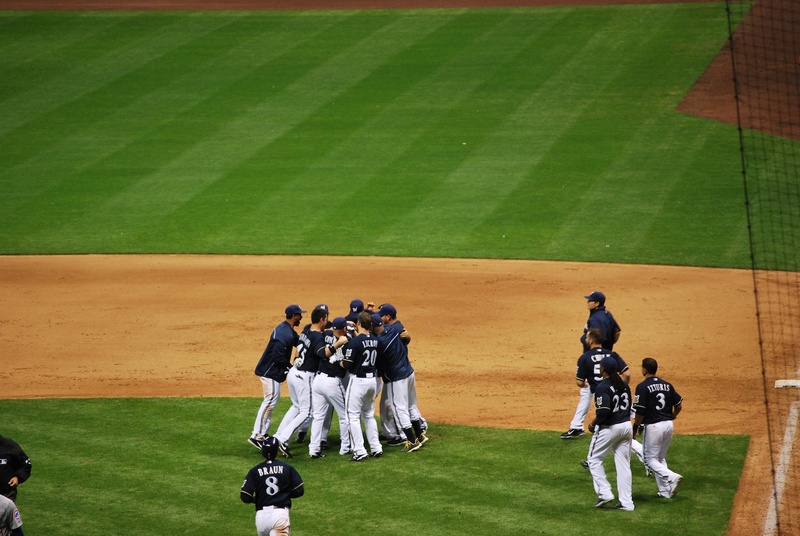 Both bullpens did a great job of keeping it tied, but in the 13th, the Brewers prevailed. After loading the bases with nobody out, Chart came to the plate again, and this time sent a bouncer up the middle that reached the outfield, and Rickie came home as the winning run. Final Score: Brewers 8 – Cubs 7. All the players mobbed Chart after he got to first. It’s hard to beat a walk-off, especially when it’s at 12:14 am. I’m leaving Fort at 10 am for the game, and since it’s 3 am now, I should probably get some sleep.